As some of you may know, each month we give away a set of extra, free worksheets that help with literacy skills and which tie in really well with particular levels of the Froggy Match-it app games. These are in addition to the free writing sheets which accompany each level of the app. These free, extra sheets are available from the Froggy Match-it website. All those who subscribe to the emailing list will be the first to know about each new set of free phonics worksheets. 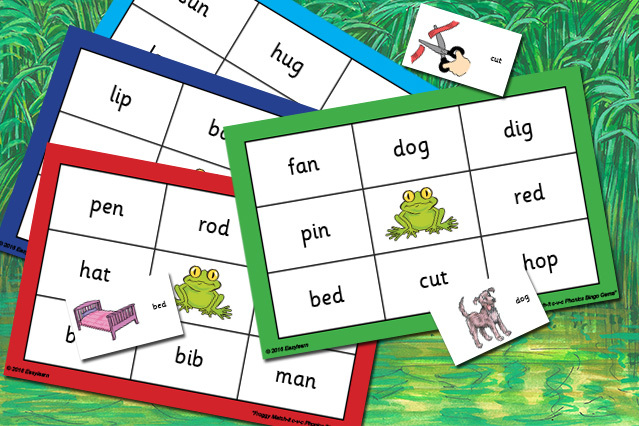 This month’s set of sheets are ideal for supplementing phonics work relating to level 1 of the interactive Froggy Match-it games, and deal with short vowel c-v-c words. The sheets can be used to make a bingo game for children learning c-v-c words: words such as cat, pen and dog. They are called Froggy’s c-v-c Phonics Bingo Game sheets: click here to take a look. The game is quick and easy to make and is ideal as a consolidation activity for a small group of children just completing level 1 of the full app or coming to the end of the free app. If you have the free app, why not download and make the free bingo game and try it out? No cost, no obligation. Look out each month for these extra, free resources from Froggy Match-it and help your child to really learn and practise their phonics.